She's Fantastic: Vintage Goodness: The Women of DINO RIDERS! Vintage Goodness: The Women of DINO RIDERS! My parents didn't buy me many toys as a child. We weren't poor by any means, but I have three siblings so hand-me-downs were a way of life for us. As a result, I was endlessly coveting my young classmates with all their shiny new toys and I would beg to run errands with my mom just to escape her grasp for a moment to gaze in wonder at the toy aisles. 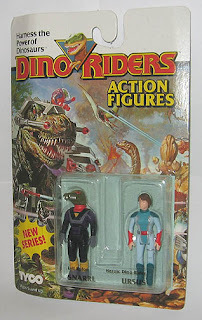 The build-up of this little story is that I have a very fond memory of finding a Dino Riders toy in my elementary school playground. He was a green lizard-man with a gold-plated chest and a clear dome over his head. I know I should have taken him to the lost-and-found box in the office.. but if you could have just seen that gold armour glinting so magically in the sunlight, you would have secretly slipped him into your overall bib too. 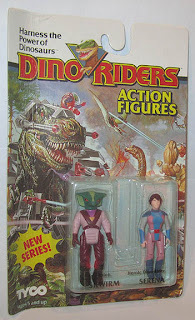 Dino Riders were awesome little toys with weaponized dinosaurs and warring alien invaders.. it was weird and brilliant and is one of the more recognizable toy franchises of the late 80's. Three women were released in TYCO's Dino-Riders toy line (all in Series 2 from 1989). 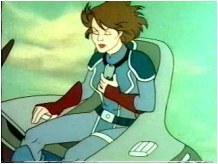 Serena is the main female Valorian (aka Humans). As far as I can tell, she is one of the only two females to appear in the cartoon (the other being Maya, the Cro-Magnon from Dino-Riders Ice Age). This is the main release of Serena which came in a 2-figure pack with the evil Rulon, Sqwirm. Next up is a variation of Serena that came packaged as one of the three Pilots/Drivers/Riders of the Brontosaurus. All three females in the line share the same mold. Lastly is a character named Ursus who did not appear in the cartoon, yet suspiciously looks more like the cartoon version of Serena than either of the previous two figures. My Ursus has a wonky leg and some missing paint, but she's still a great little figure. She came packaged with the evil Rulon, Snarrl. See what I mean about Ursus being a true representtion of cartoon Serena? Time for some Comparion Pics! And here is Serena with a Battle Force 5's Agura Ibaden and G.I.Joe's Q Force Natalie for size reference. I've been a dinosaur nerd all my 30 years so far, so I used to watch my Land Before Time and Dino-Riders VHS tapes over and over again. I found out a few years ago that there were far more than just the first two episodes i knew about, but when I tried to watch them they were pretty disappointing so I gave up. But, now that they announced a possible movie I've gone back and I am doing my best to get through them. As a kid Serena was always my favorite, she was great with the stegosaurus. 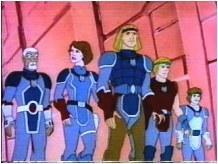 As an adult I'm realizing how weird it is that she's the only woman on the show. I was kind of hoping more would pop up later, but I guess not. I suppose maybe the ship they were all in was a military ship and didn't have a lot of women? But, then why'd they have that annoying kid with them? It's definitely a bummer to me that it's boring cookie-cutter white guys.